The skies are grey, the temperature gauge is dropping by the day, and chill winds and rain are lashing at the window – and that was just our summer! 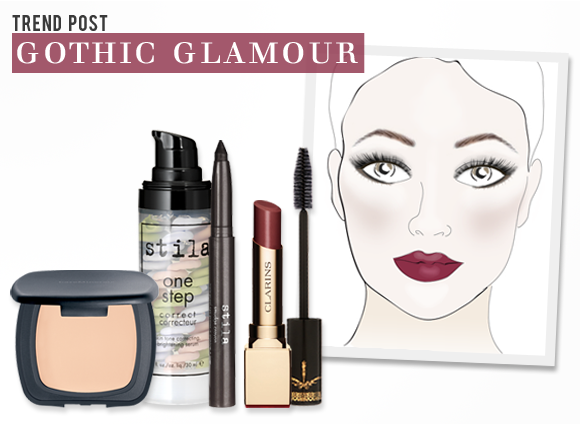 Now that autumn is officially here, it’s time to shake up your makeup bag and look forward to the season ahead. Beauty-wise we Brits have been way ahead of the game for a while now, as the cool grey days have been the perfect setting for trialing the next season’s big beauty trend: gothic glamour. The key make-up look for autumn consists of a porcelain-pale complexion, a dramatic smokey eye and blood-red lips, and it’s setting a breathtakingly beautiful new style agenda. Several catwalk looks have set the trend – on the runways at Gucci and Yves Saint Laurent, models sported ultra-pale complexions and lips stained in deep shades of black-cherry and blood red. At Jean Paul Gaultier and Lanvin eyes were smudged pure black, while at Roberto Cavalli the look was softened flashes of deep purple and dark green eyeshadow. At Givenchy the whole look was high gothic, from deadly pale skin to “bruised” lips and eyes. Always quick to spot a trend, fashion-savvy celebs are already experimenting with gothic beauty: Katy Perry was spotted out in London sporting dramatic black eyeshadow, lips painted deep crimson, pure white skin and blue-black tresses with purple tips. Meanwhile Pixie Geldof can be seen modelling pale skin, black-rimmed eyes and dark lips on the cover of Vogue. But the queen of new gothic glamour has to be Jessie J – she’s nailed the look, from her jet-black hair to her jet-black lipstick. So, if you fancy trying on the trend, how can you ensure your make-up ends up looking hauntingly beautiful and not the stuff of nightmares? First, create the perfect complexion with a primer, a medium coverage foundation and a touch of powder for a long-lasting, flawless and velvety finish. I recommend the Stila One Step Correct to even out redness and pigmentation, the Dior Diorskin Forever Foundation for perfect colour and radiance, and a light dusting of the bareMinerals Ready SPF15 Touch Up Veil on the t-zone to keep skin looking faultless. For the eyes, a smudgy, smoky look is the easiest way to tap into the trend. There is one essential tool that you need: the Stila Smudge Crayon in Dazzle, a dark grey gel-based liner crayon that can be drawn all over the eye for a block of colour, smoked out for a more diffused look, lined close to the eye for an edgy cat eye, or used on the waterline for an intense effect. It lasts for hours, moisturizes the skin, and resists heat and water. It’s a wonder product! Finish up with lashings of the Too Faced Lash Injection Extreme Volumising Mascara for dark, mysterious eyes. Finally, finish off the look with a statement berry lip, of which I have three favourite formulas for the season. If you prefer a stain, the Guerlain Rouge G L’Extrait in Avarice is the perfect fusion of comfort, colour and longevity. The blackened red of Rouge Dior 862 Hypnotic Red is the perfect vampy lip colour, or if you prefer something a little richer, the creamy Clarins Rouge Prodige in 135 Dark Cherry is just gorgeous. The best foundation I have tried which is easy to apply...you don't get tide marks as you do with other foundations, covers up small imperfections in the skin and is long lasting. I am in my late 50s and people have remarked how good my skin looks since using this product. This entry was posted on Wednesday, September 26th, 2012 at 9:00 am and is filed under Get the Look, Make-up, Special Post. You can follow any responses to this entry through the RSS 2.0 feed. You can skip to the end and leave a response. Pinging is currently not allowed.